If you think your storytelling skills are only useful for getting the kids off to sleep, think again. The ability to tell great stories can also be a powerful tool for career success. 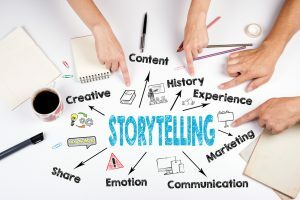 Storytelling is useful in many different scenarios – from interviews, to getting approval for a special project, to motivating and managing people. It can be a powerful way to engage and persuade. Storytelling goes back millions of years. Sharing experiences, passing down lessons and communicating to understand each other is storytelling. Doing this in the workplace isn’t new, but doing it well takes some thought and preparation. Storytelling can be used to persuade, entertain, move and motivate people – and it’s a much more interesting way for your audience to consume information. It’s particularly useful where the subject matter is complex or dry – stories can be used to invoke enthusiasm and excitement that would otherwise be difficult to achieve. Say you were providing a performance update to the company – rather than presenting facts and figures to demonstrate results, you could share a story of how a team member worked successfully with a client. Storytelling can also be useful when communicating with customers. Tell them a story about how you solved another client’s problem and your message becomes more compelling. Likewise, if you’re running an event or encouraging people to buy something from you, a story they can relate to can help them make a positive decision. Contrary to popular belief, you don’t need to have led an exciting life to be a great storyteller. Storytelling is simply about making a connection with your audience. A story about everyday life told well can be as engaging as a story about a significant life achievement. Drawing your audience in and invoking a feeling of shared experience or opinion is what’s important. So how do you do it? Understand your audience: The first crucial step is knowing your audience. Who are they, what are they looking for and how much knowledge do they already have about the topic you’re discussing? How will they be receiving the information – for example in a written report, through video, via a phone conference? This will help set the key themes and tone for your story. Make your audience care: Understand why your audience should or would be interested in your story and then make sure those messages shine through. What is the purpose of telling the story? What would you like the audience to understand or take away? Be creative but always come back to your purpose. Set the scene: Be descriptive about timing and location to help capture your audience’s attention. Set the scene well and provide context for your story. By anchoring your audience in a place and time they will be more interested in reading on or listening through until the end. Develop your plot: Something must happen in your story, so give it a beginning, middle and end. Great stories also often have a climax (maybe a challenging situation or defining decision) that is then resolved. Include detail: Make your story interesting with anecdotes and small, specific details that paint a picture and prevent the audience from becoming bored. Keep it simple: Don’t get carried away with details though – keeping it simple is important too. Stories don’t have to be complex to be interesting; sometimes the simplest stories are the most successful, but only if your audience finds it useful (remember your purpose). Use visual elements: When presenting using PowerPoint or even within written articles, use simple graphics and images if you can. Stay away from complex graphs and charts and big blocks of text. A single picture or infographic with some related words could more easily convey your message – and is more likely to be remembered by your audience. Deliver your punchline: Great storytelling is like telling a joke – you need to know when to wrap it up and ideally finish with a bang. Evoke emotion in your audience by delivering an unexpected or inspiring ending. Or you could ask a question or leave something open-ended to create suspense for a continuation of the story or a related theme at another time. Practise: Your audience will know if you’re under-prepared, and you’ll run the risk of rambling, resulting in a story that doesn’t engage your audience. Craft your story first and practise presenting it in front of a friendly audience for feedback. Storytelling can help you to convey information to your audience in interesting and memorable ways. Use stories in your work to create connections, evoke emotion and encourage action. Our highly experienced Career Coaches have many stories to tell! If you’re looking for ways to improve your career, they can help. Find out about our Career Counselling and Coaching. If it’s time for the next chapter in your career, a customised job search strategy is a powerful tool. Learn more about Job Search Coaching.